Dealing with a tot that likes to toss his taters across the room? Check out these six genius tips to stop food throwing in your toddler! I’ll be honest. Very little infuriated me more when my kids were little than watching them throw their lovingly-prepared, not-cheap food on the floor. After all, if I wanted my dogs to eat organic chicken, I would have put it in their dog bowls. While all toddlers go through a food throwing phase (I think… I hope it wasn’t just mine), there are ways that you can significantly reduce the length of the phase. Give these tricks a try, and come back to tell us how they worked for you! Put pets elsewhere during mealtime. If you have a dog or a cat (or any other animal who likes to be underfoot during mealtime), don’t let them be in the room while your toddler eats. There is too much temptation for your little one to drop food into the waiting mouth of your four-legged friend. It’s immediately a fun game, and that’s a hard habit to break! Create a place mat. Get out the construction paper and markers, and create a place mat for your child. You could draw a face so that your toddler can create hair, a mustache, or a necklace out of food. It could be as simple as a maze that the food can weave through. If your child is older and has advanced to plate throwing, affix a picture of a plate, cup, and utensils to model where those items belong. Laminate your place mat for easy cleaning, and tape it to the table. If you’re not feeling crafty, there are all kinds of place mats like this one that will work great. Mealtime will be more fun, giving your toddler less reason to find his own entertainment. Introduce utensils. Toddler fingers can handle utensils (Gerber Gerber were my favorite) earlier than you might expect. It will take a lot of concentration for your little one at first, and that may help curb throwing of food. Be careful not to let him get frustrated if he’s having a hard time, though, because frustration may cause throwing (completely negating the point!). Once he gets the hang of a fork or spoon, you’ll likely see throwing subside. Don’t overwhelm with choices. My husband is an “in excess” type of person. If fruit is good, we should give three fruits with dinner, right? Wrong! If your toddler is a thrower, too many choices of foods and too much on the tray will only make things worse. Give one or two foods at a time, and two or three small pieces of each until they are gone. Then give more. Otherwise, half of what you provide will end up on the floor. When all else fails, mealtime is over. My older child was a very small toddler, and this concept was very hard for me. Her therapists all told me that if she threw food, I needed to take it away and stick to my guns. I wish I listened. In hindsight, I could have saved myself so much frustration by simply driving home the point that if she threw food (even one piece), dinner was over. Learn from my mistakes and just do it. Your future self will thank you. It’s best to nip food-throwing in the bud right when it starts, but it’s not too late! Incorporate some of these ideas into your mealtime routine, and soon, mealtime will be much less stressful. Do you have any other great parenting tips to help stop food throwing in toddlers? Share below! My oldest use to fling food everywhere. He was a hot mess. My youngest thankfully only did it for a few weeks and grew out of it. It can be a tough time but these are great tips, I saw a really cool bowl for toddlers the other day on facebook! My son and I always eat together when he was little and I can’t remember him throwing food. But I do think these are great tips you shared. You are so right about food throwing often being a sign that little one wants attention or is done with eating. With a handful of kids though it can be so hard to make sure all the ducks are in a row so to speak. Eating together certainly helps! I remember those days so well, lol. I didn’t have tips like these to guide me back then so I know they’re going to be really valuable for new parents. Omg my daughter did this for the longest! Sometimes she still does it lol My son never threw food so I had NO idea how to handle my daughter. These are great tips. My daughter thought it was great fun to throw food and these suggestions would have come in really handy. These are some great tips. I remember these days all to well. 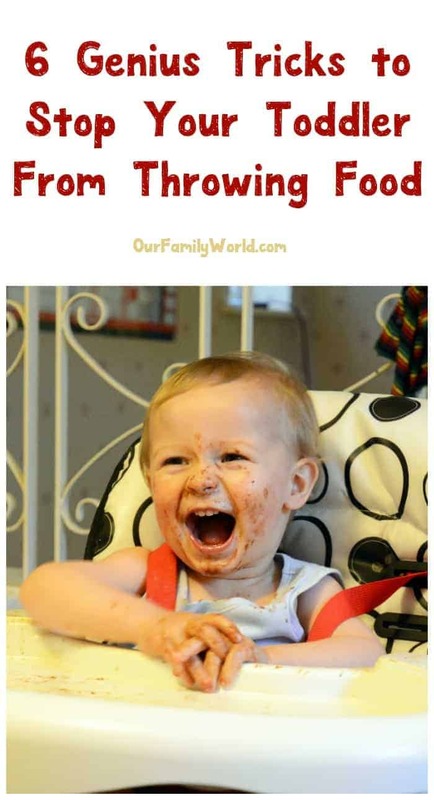 My kids would throw food sometimes too. My youngest nephew is almost two and enjoys feeding the dog his food once he’s full. I look forward to sharing this informative post with my sister. Thanks! My youngest nephew is almost two and enjoys feeding the dog his food once he’s full. I will be sharing this helpful post with my sister very soon. Thanks! These tips sound like such a lifesaver. I used to hate it whenever it was feeding time and my son wanted to play “let’s wear our meal.” You gave such great tips, thanks for sharing! Some very good ideas and advice here. Mine never threw food but they did make a mess playing in it!